Yahoo! MapMaker for Excel is a Microsoft Excel template that enables any user of Excel to plot data on a Yahoo! map without programming. Just enter geographic data (up to 100 locations) into the spreadsheet, and after a few clicks, whammo, instant map. No Web server required. You can provide address/city/state, latitude/longitude pairs, or a column containing nothing but ZIP codes. Optionally you can assign titles and descriptions to each map point. This tool is useful if you want to create a map that displays more than one location (a store locator, for example), or if you want to overlay a bunch of information on a map. 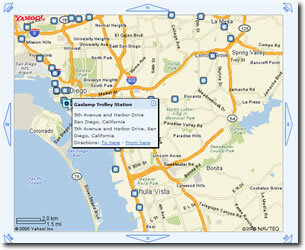 I created maps of the Bay Area Rapid Transit system and the San Diego Trolley system using the tool. Version 1.02 is a bug fix release (the name of a Yahoo! Maps API server changed, so the code in the template was updated to reflect this). Version 1.01 adds support for the Country tag, which provides the ability to plot addresses in both the U.S. and Canada. It also fixes a bug that made the template non-functional with some configurations (particularly Excel 2000). This has been tested on Microsoft Excel 2003 running on Windows XP. It should work on earlier versions of Windows (possibly going as far back as Windows 98) as well. People have reported that the template works on Excel 2000 and Excel 97 as well. This tool is freely modifiable and distributable. You can view the source code in Excel's Visual Basic editor to see the details of how this was done, if you're into that kind of thing.To share the maps you create using this tool, you've got three options. First, you can save the spreadsheet and mail it to whoever you want to share it with. Second, you can save the HTML file in the browser generated by the macro and mail that, or put it on a Web server, if you have one. But if you have a Web site already, the best way to share is to save the XML data that appears in the text box of the Web page generated by the tool onto a Web server, then create a link back to the location of the file (this is how I published my BART and San Diego Trolley maps). You can find more documentation on programming Yahoo! Maps on the Yahoo! Developer Network site. The Developer Network team supports Yahoo! maps developers in the Yahoo! maps group.